19. 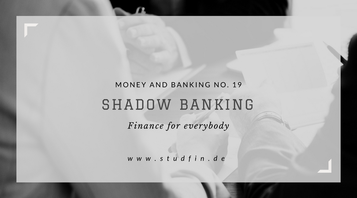 Shadow Banking - Studfin - Einfache Geldanlage! I know the topic of shadow banking is hard to grasp but as it counts for over $45tn; you might want to give it a try. What do we know about traditional banks (Find more information in the post: Why do we need banks? ). They borrow short (by getting money from their clients through deposits) and lend long (by giving away mortgages or long-term credits to companies). Due to the fact that they borrow short and lend long, the banks are exposed to maturity mismatches. These maturity mismatches are the reason that banks need to be able to extend debt obligations and borrow money to stay liquid. To stay liquid they can borrow money in the Fed Funds or Repo Markets (Click to recap FedFunds and Repos)and even if these are dried up, they would be able to borrow money from the central bank (Link to learn more about the role of central banks). The central bank is backstopping / supporting the banks. Therefore, the banks have the reassurance from the central bank to borrow money against good collateral. Good collateral means treasury bonds or bills. There is also a financial intermediary involved. He bundles the loans, ties them up and categorizes them. He classifies them using their default risk at put them into tranches. The risk that a low tranche is going to default is much higher than the risk that a high tranche is going to default. 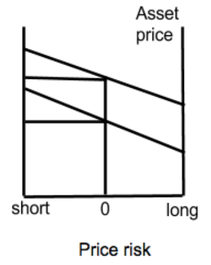 A shadow bank borrows in the repo market and uses high tranches as collateral. There is also a financial intermediary involved. He bundles the loans, ties them up and categorizes them. He classifies them using their default risk at putting them into tranches. The risk that a low tranche is going to default is much higher than the risk that a high tranche is going to default. A shadow bank borrows in the repo market and uses high tranches as collateral. They all work together, backstopping each other. If all "insurances" (Credit Default Swaps CDS and Interest Rate Swaps IRS) and interest rates are calculated correctly, there should not be a systematic risk. The only risk is liquidity problems, which can be solved by rolling over debt and borrowing money. A key player in this system is the derivative dealer (Find out more about dealers). Dealers prefer to have matched books and they adjust the prices to get matched books. However after they set a price, they are willing to sell the derivative at that price. They also charge a "fee", which is shown on the inside spread. If they are far away from having a matched books or if it is risky, the prices will go up (On the left you see the Treynor Model, click on it to find out more). If the situation gets really messy the dealers might completely stop buying derivatives or securities, which means they stop providing liquidity. The lack of liquidity causes the system to struggle, as debts cannot be rolled over anymore. The survival constraint will hit quickly, and the first intermediaries won’t be able to make payments. The dealer system is not backed up by a central bank. Therefore, a robust dealer system is essential to backstop the (shadow banking) system. During the financial crisis, the central bank had to do this job, by buying the risky assets (mostly the mortgage-backed securities) and taking them on their balance sheet. As they acquired the risky assets, they provided liquidity to the system. If the central bank becomes not only the lender of last resort but also the dealer of last resort, they could help out the dealer and keep the system stable. What could the central bank do? The help of a central bank whether it is for dealers or banks should only be short term and never permanent. This means that the central bank only helps to deal with liquidity problems and never with solvency problems. If they helped to solve solvency problems, there would be moral hazards, and taxpayers have to bail out financial intermediaries. But if the central bank backstops the dealers to ensure a flow of securities and derivatives, nobody has to be afraid that they could not get liquidity and the system would be more stable. As I said this topic is very difficult to understand but as it counts for $45tn and still growing it is important to you develop a slight understanding about it.